and it surrounds your whole body or object in all directions. The fact that you might not be able to see it yet does not mean that it does not exist. In the past it was believed that auras was only visible to certain people with special psychic powers. However, with a little bit of training and practice, or using "pinacyanole bromide" screens or goggles, anyone can see the aura as a definite emanation from the physical body. So you have decided that you want to see auras. 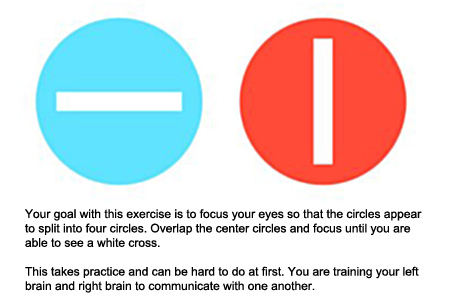 Before you begin staring at people I would suggest that you first learn to retrain your eyes as you need still, focused and peripheral vision to be able to see them correctly and effectively. or maybe even playing a video game or two. It is important to understand that when your eyes are in constant movement, similar to watching a video, where frames of action seem to flow fluidly, things are processed in a slightly incomplete manner. In a way all this has damaged your eyes and to learn to see auras you will have to retrain your eyes and learn how to use a new kind of vision, focused still peripheral vision. To learn this new kind of vision do the aura exercises below and you can increase the processing power and sensitivity of your eyes, which will help you in your quest to seeing the aura. Place a small sticky dot or piece of paper in the middle of their forehead. Sit about four feet away. Place your hands up in front of your face, and hold your fingers as if you were framing a picture with thumbs pointing inward and your index finger pointing up (Like two "L's" pointing inward). Loosely focus on the dot on your friend's forehead. 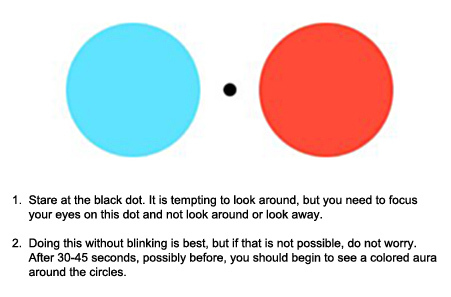 While you are doing this, move your hands apart slowly, further and further apart, keeping a loose focus on the dot, and allowing your peripheral vision to follow your hands. If you keep trying this exercise you will soon see a thin layer of light around your friend's head! If you try several times you may even see color. Keep at it! Sooner or later you will see auras. The aura must be viewed with the "inner eye"
There is a method for loosening up your auric field, which can be done at any time. It is very effective and helpful, especially when someone is depressed or weighed down. The person should stand in front of you with their eyes closed. Now starting at the feet and working your way up, loosen up the aura as if you were whirling feathers into the air. Repeat from all sides, until the whole aura has been treated. This should cheer people up and help them feel less weighed down and freer. To gain back your energy given through the day and to give people back their energy, simply state out loud, or in your mind, "I release your energy back to you and I take back all of my energy from you". Intimate knowledge of how too look after and protect your energy body and energy fields is something everyone should have, I can not tell you how many times I have helped myself, clients and students over bad places with this knowledge, get it now and improve not only your life but that of your family and friends.